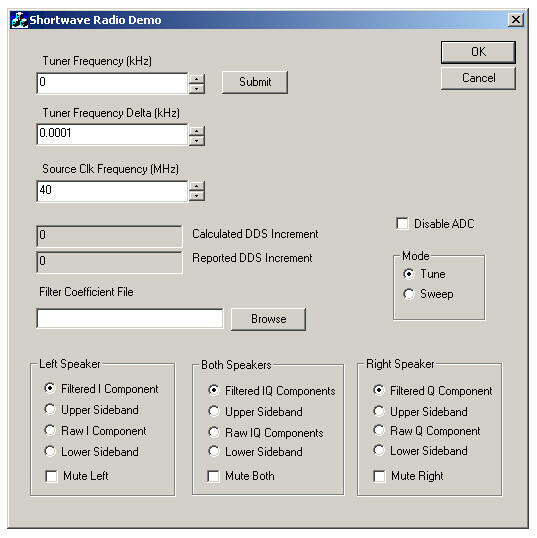 The entire radio, with the exception of the A-to-D converter,is implemented in the FPGA! We demonstrated this radio at the IEEE Field-Programmable Custom Computing Machines (FCCM) conference on April 9, 2003 and at The Military and Aerospace Programmable Logic Device (MAPLD) Conference, Sept 8-11 2003. This design was developed as a capabilities demonstration and as a design example for a book on DSP with FPGAs that has not been completed.